We all have (well, many of us) super busy lives. And, as a result, when it comes to our dietary needs, it makes it very challenging to sometime go the wholesome and healthy routes. It is quite easy and convenient to visit our respective neighborhood store and buy the ready-made food products on hand. And, that’s the case with coconut milk. The marketplace is loaded with different brands of coconut milk packed in cans. Some of the popular names out there are: Grace Kennedy, Ocho Rios, Goya and more. I like to keep a few on hand for when I’m strapped for precious time or run out of the fresh type. However, I often opt for the fresh one as much as I can because it reminds me of my island domain, Jamaica. 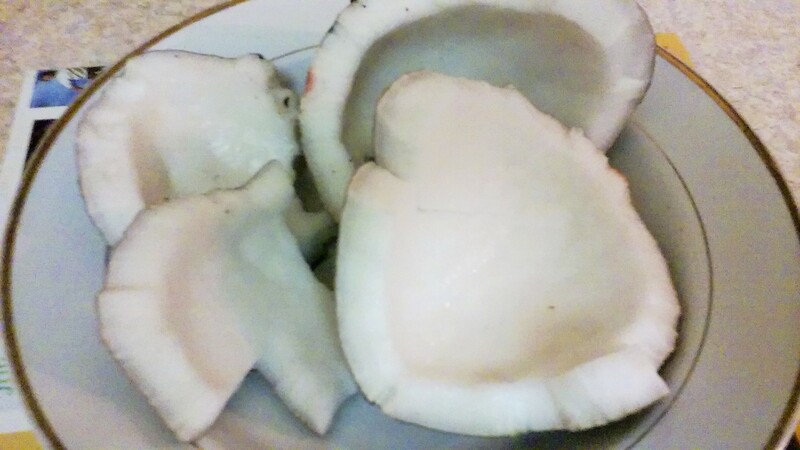 Coconut is a staple here and over 89 countries around the world. Top producers are India, Indonesia, Philippines and others. Studies have shown that coconut is loaded with essential nutrients that are beneficial for heart health, great energy source for the body, and many more pluses. I use a sharp knife to cut these in sizable pieces to accommodate my standing blender. Water is poured on same and then coconut is blended to a beautiful white finish. All is need to be done it use a strainer to separate the milky liquid from the remnants of the coconut. This coconut milk can be used in: smoothies, rice and beans, curried chicken/or goat or in any other dish that calls for milk. It will provide enormous flavors that will enhance these dishes.